Dr. Kenneth S. Cayer the owner of Greater Portland Chiropractic. 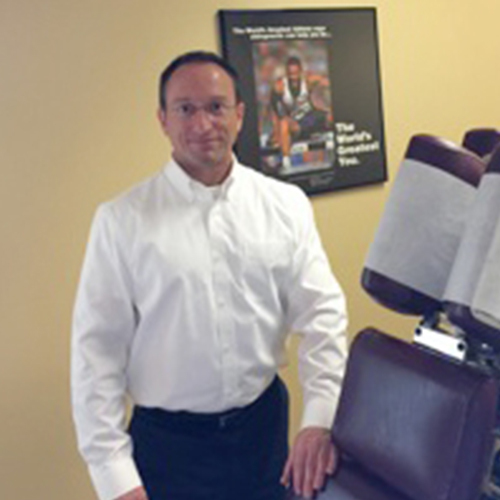 He graduated from Palmer College of Chiropractic, the first college of Chiropractic, in Davenport, Iowa in 1997. Dr. Cayer completed his undergraduate studies at the University of Maine at Orono with a major in Health Education, a minor in Nutrition, and a concentration in Exercise Physiology. Dr. Cayer is certified by the National Board of Chiropractic Examiners and is a member of the American Chiropractic Association and the Maine Chiropractic Association. Dr. Cayer is also a member of Delta Sigma Chi Fraternity, the first fraternity of professional Chiropractors. He also holds a current Chiropractic License in the State of Maine. Earlier experience in preventive health care methods included holding the position of staff supervisor of the preventive medicine program at the University of Maine’s Cutler Health Center. He continued his work in the health and fitness field and eventually established himself as a successful personal trainer at the exclusive Sports Club/LA in Los Angeles, California where he progressed to a supervisory role, managing the facility and staff to the highest standards in the industry. Dr. Cayer’s undergraduate education combined with a strong personal commitment to regular exercise, proper nutrition, adequate rest and stress management has made a career in wellness a natural progression. His chiropractic education and clinical experience enable him to successfully detect, correct and prevent spinal vertebral lesions. It is this combination of experience and education that cast Dr. Cayer as a leading authority in the guidance towards wellness. By attending professional seminars involving the latest clinical approaches recognized by the International Chiropractic Association, including specialty-field seminars in Chiropractic Pediatrics, Dr. Cayer is kept up to date on the latest in Chiropractic health care. He is also a vocal advocate of Chiropractic and preventive health care, offering his educational message of wellness to the public at his many speaking engagements to local business and professional organizations. A native of Maine, Dr. Cayer is proud of his family and his Maine heritage of hard working people. This same heritage has also promoted an appreciation for and ability to enjoy our beautiful state. It is with his caring spirit, educated mind, and skilled hands that he is dedicated to guiding his patients towards wellness, their own personal 100%.